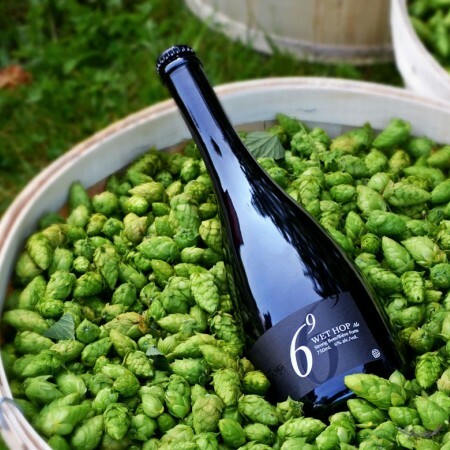 NIAGARA-ON-THE-LAKE, ON – The Exchange Brewery has announced the release of a new ale brewed using freshly picked local hops. Our Wet Hop Ale has a beautiful light gold color with a grassy and resinous nose. Citrus and grassy notes continue to shine through leaving a balanced bitterness behind. It pairs perfectly with mussels and exotic dishes such as sushi, a Thai mango salad or a Hawaiian pizza. It will also work great for dessert with a ricotta lemon cake, a New-York cheesecake or a crème brûlée. So many possibilities! The Exchange Wet Hop Ale is available in 750 ml bottles at The Exchange retail store and online delivery service while supplies last.